Here at Hope & Harmony Farms, we love to create new recipes and enhance existing recipes by using our own peanuts. With each recipe, one of our top priorities, aside from taste and nutritional profile, is that each dish is quick and easy to prepare. We understand the time constraints families can face with attempting to maintain a balanced diet. We’ll always aim to bring you nutritional recipes that don’t force you to choose between time and nutrition. Place the fresh basil in a food processor or blender and process until finely minced. Add all the other ingredients except oil, and process until peanuts are finely chopped. Lastly, add the Green Peanut oil, and process until mixture is creamy-smooth. Use your fresh pesto as a salad dressing, toss with veggies, or serve with chicken or pork. 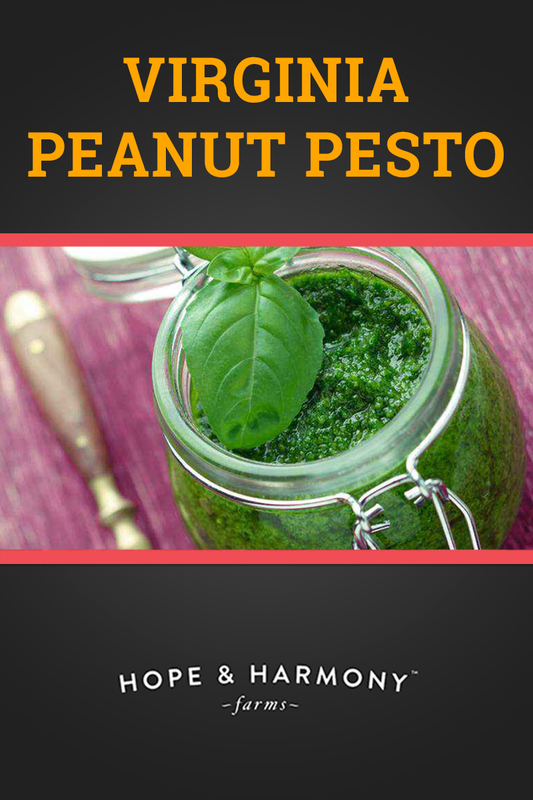 This Virginia Peanut Pesto recipe is best used as a ready-made addition to stir-fries, salads, or as a dip for a healthy snack. We recommend pairing this tasty pesto with your favorite vegetables (celery sticks and carrots work great)! We guarantee the kids will finally eat all of their veggies! This recipe is packed with basil, which exudes a sweet aroma so tempting you want to add it to every dish. 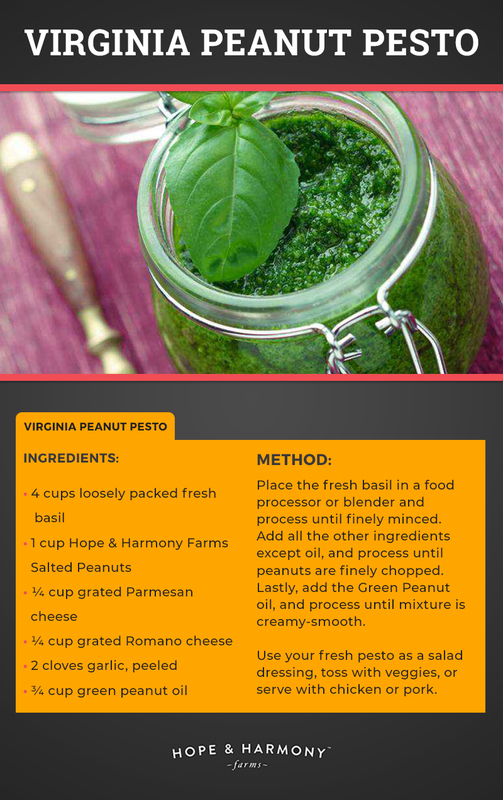 Combined with our very own Hope & Harmony Salted Virginia Peanuts, and the perfect serving of Parmesan and Romano cheese, this Virginia Peanut Pesto recipe is sure to hit the spot.